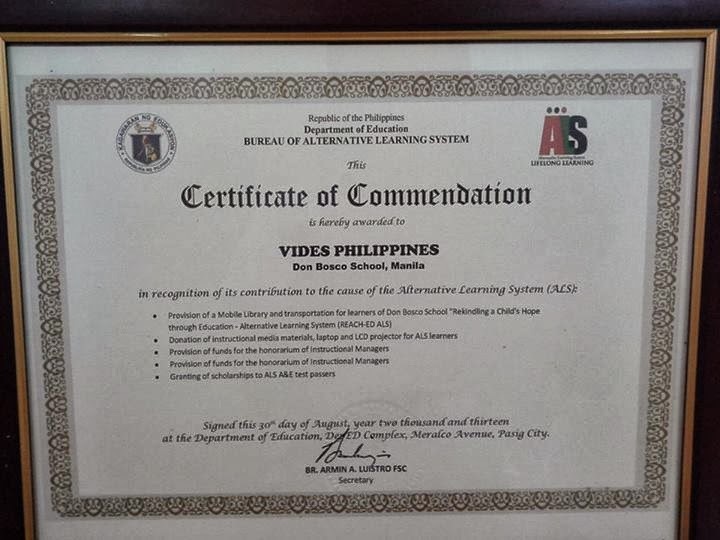 VIDES Philippines received a Certificate of Commendation signed by no less than Br. Armin A. Luistro FSC, Secretary of the Department of Education (DepEd), for its invaluable contributions to the cause of the country's Alternative Learning System (ALS) Program. DepEd specifically lauded VIDES for supporting Don Bosco School's ALS program called Rekindling a Child's Hope through Education-Alternative Learning System (REACH-ALS). The volunteer foundation has provided a Mobile Library and transportation for ALS learners of Don Bosco School-Sta. Mesa, donated instructional media materials (laptop computers and LCD projector), provided funds for the honoraria of ALS Instructional Managers, and granted scholarships to ALS test passers. This recognition is another feather in the cap of VIDES Philippines, which, with the help of its generous donors and benefactors, shall continue to help out-of-school youth attain their dreams of earning a high school diploma, their key to a brighter future.